Rajnath Singh also asked India's top police brass to take strong action in cases of riots and desecration of religious places. 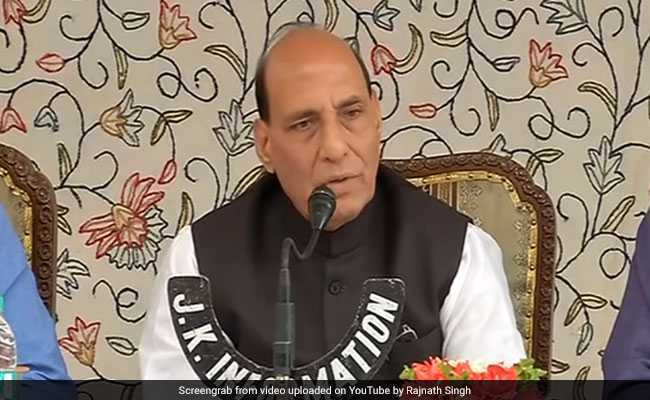 Rajnath Singh said terror infrastructure in the form of training camps continued to exist in Pak. Tekanpur: Home Minister Rajnath Singh Saturday said terror infrastructure in Pakistan continued to exist and the neighbouring country was leaving no stone unturned to instigate the youths of Jammu and Kashmir against India. Addressing the annual conference of the DGPs and IGPs in Tekanpur, Mr Singh said terror infrastructure in the form of training camps, launch pads and communication stations continued to exist in Pakistan and Pakistan Occupied Kashmir (PoK). Mr Singh said Pakistan's encouragement to the separatist anti-India sentiment in Jammu and Kashmir often led to law and order problems. Referring to the north-east, Mr Singh said insurgency had come down in the region but camps and hideouts of underground outfits in Myanmar was a matter of concern. The home minister said there was a slight increase in communal violence in the country and asked the top police officers to take strong action wherever such incidents and desecration of religious sites take place. Mr Singh also talked about growing incidents of cyber crime, use of Internet and social media by anti-social elements to create tension in the society and asked police officers to be vigilant. Prime Minister Narendra Modi will address the three-day conference tomorrow. The Narendra Modi-led government has been organising the conference outside the national capital since it came to power in 2014. The last three conferences were held in Guwahati, Rann of Kutch and Hyderabad.